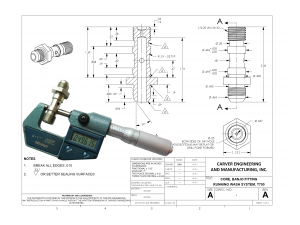 Engineering Drawings | Carver Engineering and Manufacturing, Inc.
Let us help you look your best on paper. Working from a sample part, an existing or obsolete blue print, or even just a description of the part, we can produce a professional engineering drawing that will impress your customers, lower your cost, help your suppliers and keep everyone on the same page as your part gets quoted, sold, manufactured, inspected and shipped. Carver Engineering and Manufacturing can be your in-house engineering department. We will be sure your part is documented to include the right material and finish specifications, dimensional tolerances and test requirements. We can design your part or assembly from scratch too. We will even work with your customer or vendor throughout the sales cycle and beyond. Send us an enquiry and don’t ever let the lack of a good blue print hinder your sales opportunities again!